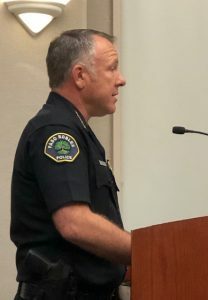 Paso Robles Police Chief Ty Lewis told the city council Tuesday night, the department is understaffed by about 20 officers. Lewis told the council that response time averages 15 minutes per call, as a result. The council heard testimony from several citizens, including John Gannon, who complained about the theft and annoyance of homeless people hanging around his business on 24th street near 101. He says the homeless people are scaring away travelers who stop at his business. 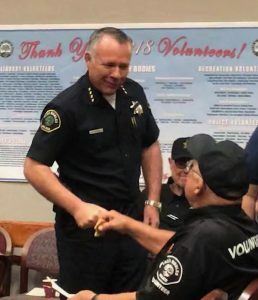 After lengthy discussion, the council voted unanimously to receive and accept the police chiefs report and to encourage staff to schedule as soon as possible a community workshop to discuss the shortages and costs of the police department. The council also proclaimed May as California Tourism Month. Mayor Steve Martin gave Dana Stroud of Travel Paso a proclamation celebrating the travel industry locally. Dana is Executive Director of Travel Paso, which promotes tourism in the city. 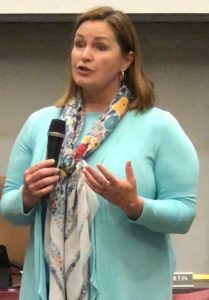 The council approved a number of items in the consent calendar including the elimination of overdue fines at the Paso Robles City Library to facilitate community access to information. The council also approved spending $182,346 dollars to construct a patio roof at the Airport Terminal.